After over 24,000 consumers and businesses shared their feedback, today Smart Money People can proudly reveal the full list of winners in the British Bank Awards 2018. A full list of our 2018 Finalists can be found here. More pictures from the night will shortly be added here. A number of our 2018 winners are younger FinTech firms, with the likes of Moneyfarm, Bud, WeSwap, WiseAlpha and Starling Bank all bringing to market markedly differentiated consumer propositions, and helping to make the financial services landscape increasingly competitive. The mutual sector continued its hold over the ‘Best Savings Provider’ and ‘Best Mortgage Provider’ categories, with both the Darlington Building Society (Savings) and the Newbury Building Society (Mortgages) taking home these awards this year. Even with more competition across the board, four firms were able to win their categories for the second year running. These firms included: Zopa (Best Personal Loan Provider & Best Alternative Finance Provider), Money Dashboard (Best Personal Finance App), Virgin Money (Best Credit Card Provider) and NatWest (Best Banking App). Mike Fotis, the Founder of Smart Money People said, "Consumers and businesses come to Smart Money People to share their feedback about financial firms all year round. And what's been particularly pleasing to see is how more and more consumers are actively keen to recognise firms that are delivering exceptional levels of service and innovative products, while remaining vocal when firms fail to deliver the high standards we all increasingly expect." 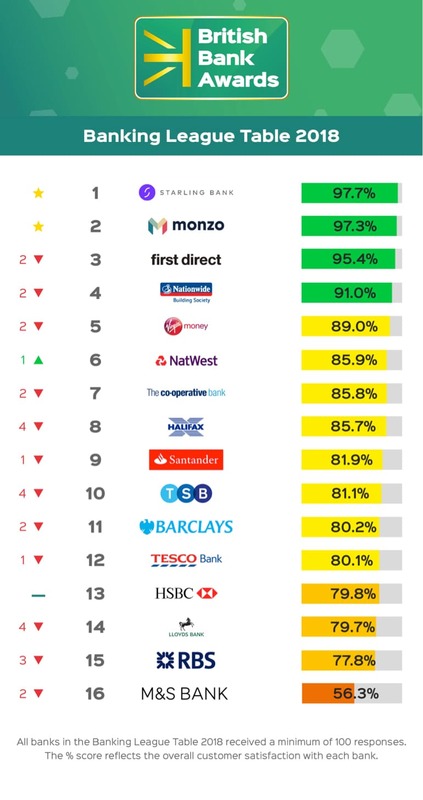 Alongside our list of winners, today we’re publishing our Banking League Table 2018 which rounds-up the customer satisfaction scores seen across Smart Money People in the last 12 months. After topping our Banking League Table for three years in a row, first direct fell to third place, with mobile app-based Starling Bank and Monzo taking home the top two positions in their first year of appearing in our Banking League Table. NatWest is the only bank to improve its overall position, climbing one spot to sixth place, while M&S Bank remains the least loved bank in Britain for the second year running. Now in their fourth year, the British Bank Awards aim to find the best products, hottest innovation and most trusted financial brands. You can find out more about the British Bank Awards here. 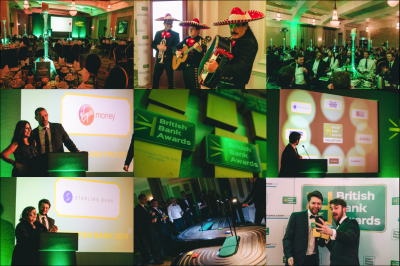 So what’s ahead for the British Bank Awards 2019? Well, it’s safe to say, that the financial landscape looks set to become more competitive over the coming year, and we’re already looking forward to seeing this reflected in the voting process. And with more new banks on the horizon, we look forward to including more of them in our Banking League Table. But perhaps NatWest’s rise to 6th position shows that the UK’s largest retail banks aren’t ready to throw in the towel just yet.